As predicted, Sunday’s away game against Atlético Mineiro proved a hard nut. Palmeiras got the early goal, Andrei Girotto bagging his first for Palmeiras putting his forehead to a perfectly timed cross by Lucas. As we’ve seen before, the goal stopped Palmeiras dead in the tracks and Atlético dominated the rest of the first half completely, going into halftime with a 2-1 lead after two goals by Lucas Pratto. Marcelo Oliveira promoted change already at halftime and again with ten minutes on the clock: Egídio (again terrible) gave way to Robinho, who did a good job in the middle while Zé Roberto took over the left flank. In another offensive move, Gabriel Jesus replaced Girotto. Palmeiras gradually increased ball possession and pressure, which culminated as Barrios replaced Alecssandro. Unfortunately, and in spite of many chances, Palmeiras were unable to equalise. Palmeiras are parked fifth in the tables, now twelve points behind Corinthians and eight behind Atlético. Grêmio are six points ahead, Fluminense two. Some palmeirenses are chucking in the towel, forgetting the title and refocusing on the Libertadores spot (awarded to top four teams). Too early, in my opinion: Palmeiras have every possibility to win upcoming games against Joinville and Goiás, before receiving Corinthians at the Allianz Parque. Nine points won, and anything can happen. Lucas Barrios seems to understand this. Yesterday, we learnt that he asked Paraguay national coach Ramón Díaz not to call him up for a friendly against Chile in two weeks’ time. Barrios explained he preferred fine-tuning at Palmeiras and be available for the derby, and his request was duly granted by Mr. Díaz. Now that’s how you make an impact. Leandro Pereira seems to be feeling all this and possibly preparing a move. The current top scorer has not had many opportunities with Marcelo Oliveira as of late and a deal seems close with Belgian club Brugge. 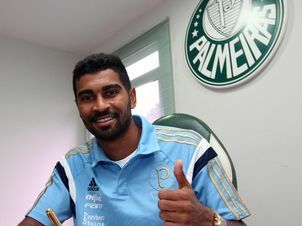 Palmeiras hold 50% of the 23-year-old, the parcel purchased for R$ 5 million. If the deal goes through, Palmeiras might make a small profit, something like R$ 1 million. The transfer window closes on 31 August. Defensive midfielder Thiago Santos is the 25th athlete to join Palmeiras this season. The idea is for Thiago to suppress the impact of Gabriel’s absence (out for the remainder of the season due to a knee injury). Sporting good numbers playing for América Mineiro in the second division, Thiago is welcomed by former club companions Vitor Hugo and Andrei Girotto. Also worth mentioning: the 25-year-old was brought in with the help of main sponsor Crefisa, who paid the fine to yank him from América and will also pay his salaries. In other words, same procedure as with Barrios. Thiago’s contract ends December 2018. Speaking of injuries: Cleiton Xavier has come down with a muscular problem and is expected back in playing condition no earlier than late September. Arouca is recovering, but will not face Cruzeiro tomorrow, hopefully being available against Joinville on Sunday. 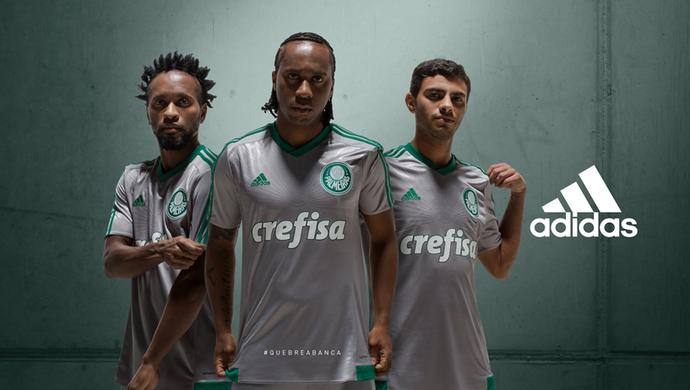 Palmeiras have released pictures of the new third jersey for 2015: a silvery/gray piece with something resembling a watermark on the chest, displaying an image of the 1915 Savoia Trophy – the first trophy won by Palmeiras/Palestra Italia, beating Sport Club Savoia 2-0 in the team’s first game ever. PALMEIRAS 101th BIRTHDAY! Yes, tomorrow Wednesday 26 August marks the first year of Palmeiras’ second centenary! And what a birthday, with a decisive away game against Cruzeiro for a spot in the quarterfinals in the Brazil Cup. A draw and Palmeiras are through to the next phase. Next Happy 101th Anniversary, S.E. Palmeiras!